Overview: Queen of Heaven's Sports Program offers a variety of sports for boys and girls from first through eighth grade. Our sports program focuses on building confidence and teaching not only athletic skills, but also life skills such as sportsmanship, teamwork, leadership, building character and learning how to win with class and lose with grace. 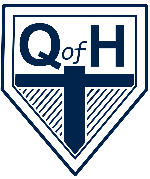 Participation in the sports program enables each student to enjoy the entire Queen of Heaven experience. QOH Permission Slips, Sports Fees and Deadlines: All students are required to (1) submit a completed/updated Permission Slip, (2) pay the applicable Registration fees and Uniform Deposits, and (3) have an updated Sports Medical Physical Form on file with the school nurse before they can be permitted to participate in any sporting event (including practices and games). The Registration fee is $25.00 per student per sport. The Uniform Deposit is also $25, and the purpose of the Uniform Deposit is discussed below. For each student participating in a sport, the completed Permission Slip Form, the $25 registration fee and the $25 uniform deposit should be sent to the school office in an envelope labeled “Sports Forms” by the deadlines listed below for each season. No permission forms should be given directly to any coaches. No cash or checks should be given directly to any coaches, but should be sent to the school office. No cash will be accepted. Students cannot participate in any sport without submitting the fees, uniform deposits and a completed Permission Slip from the parent. No player will be guaranteed a roster spot on any team until Permission Slips, fees and deposits are turned in. A copy of the Permission Slip Form can be found at the “Handbook and Forms” Tab to the left of this webpage. More information about these Forms is also included at the "Handbook and Forms" Tab. Uniform Policy / Deposits: The Sports Program has adopted a uniform reuse policy that allows teams to use uniforms from year to year. The policy enables the Athletics Program to keep costs down and keep our sports fees as low as possible. While most of our uniforms are returned, we have not always been successful in collecting all uniforms. In the past, the Athletic Program has spent hundreds of dollars each year replacing un-returned uniforms. To avoid such costs, the Athletic Program now employs a policy requiring each player to make a $25 uniform deposit at the beginning of each sports season, which is refunded at the end of the season when the uniform is collected. A student will not be issued a uniform for subsequent seasons until previous uniforms have been returned (or until it is determined that the jersey is lost so that the uniform deposit check can be cashed). Similar policies have been in place in other Catholic Schools and have been successful. Your refundable uniform deposit check will not be cashed unless the School does not receive your uniform. The fee is $25.